President Maithripala Sirisena forecast in just two words the upcoming political events. “Api bahinawa” or, we will get down to work, he declared at Thursday’s meeting of the National Executive Council (NEC), the apex body that steers the Yahapalanaya (good governance) policies. The context in which the remarks were made underscores its significance. It came after Janatha Vimukthi Peramuna (JVP) leader Anura Kumara Dissanayake raised issue over the non-fulfilment of pledges made to the people ahead of the January 8 presidential election. His catalogue included the delay in taking action against those facing charges of bribery, corruption or other malpractice. He cited the high profile investigations into the “floating armoury” and alleged that the Attorney General’s Department was not acting on the findings. Directions by the NEC were not being followed through. Though more than two months in office, he lamented that no one had been arrested or action taken. This was also the case with regard to many pledges made in the 100-Day Programme of Work. “How can you go on like this?” he asked. Amidst charges by his critics that he is using temples for politics, former President Mahinda Rajapaksa is seen taking part in a ceremony at Abhayaramaya in Narahenpita. That Dissanayake had attended the meeting armed with a mandate from his party to pull out of the NEC was not known by many. However, he changed his mind after President Sirisena conceded that there had not been enough forward movement. It was just then that Sirisena remarked that he would get down to the task. The President said he would also give the necessary instructions to the Attorney General. Those remarks, no doubt, raise some important issues. Most leaders in the Government when in opposition criticised the fact that the Attorney General’s Department was brought under the President’s purview by the previous administration. Instead of allowing the Attorney General’s Department to function independently, giving it instructions raises a question over good governance. This is particularly since there should not be pressure from the top. Of course, there had been politicisation of the Department but the answer lay in removing such elements and not making it a Government arm. Yet, Dissanayake made clear that the JVP would do some ‘stock taking’ on April 21 and decide thereafter whether it should serve in the NEC. “If we find the assurances given have not been fulfilled, we will quit,” he told the Sunday Times. Among the other issues listed by the JVP leader were pledges in the Government’s 100-Day Programme of Work, the non-implementation of some budget proposals and the delay in the formulation of a code of conduct for “all representatives of the people” as pledged before the presidential poll. He criticised the ‘misdeeds’ at the Central Bank where Governor Arjuna Mahendran has come under investigation. Later, Prime Minister Ranil Wickremesinghe told the Sunday Times the findings of the three-member Committee appointed to probe the issue would be presented to Parliament possibly next week. Though President Sirisena did not spell out what tasks he was going to get down to, steps contemplated by the Police, the Commission to Probe Allegations of Bribery or Corruption as well as the Attorney General’s Department indicate a series of arrests in the coming weeks. That is to be followed with indictments in courts. That it comes when the rainbow coalition is 87 days old with only 13 days remaining is one thing. More importantly, that such an exercise is being undertaken just weeks ahead of dissolution of Parliament seems a double edged weapon. The absence of a communications strategy to educate the public on who in the previous administration has done what wrong is to some extent to the Government’s disadvantage now. It comes at a time when those opposed to the Government have already made accusations of a witch-hunt. Thus, the Government runs the risk of heaping public sympathy in favour of those arrested or charged. On the other hand, the Government’s inaction and the resultant loss of public confidence will be the heavy price they have to pay for their intransigence. This is first for succumbing to extraneous pressures to put things either on hold or for not genuinely ensuring that investigations are concluded impartially. Second, for not having a cohesive communications strategy to keep the public informed of the wrongdoings so they understand why follow-up action is necessary. In fact, for Sri Lanka Freedom Party (SLFP) members who accepted ministerial and other positions, these issues have become a subject of some concern. A group led by Fisheries Minister Mahinda Amaraweera had a late night meeting on Thursday with former President Chandrika Bandaranaike Kumaratunga, one of three who are running the rainbow coalition. The main complaint appeared to be the fear that they would not be able to return to their electorates and campaign at the parliamentary elections. They had joined the Government and accepted portfolios with the understanding that leaders in the previous administration would be dealt with for the wrongdoings. The group alleged that instead of dealing with them, some in the Government were protecting those concerned. They said that when they were with the former President, he had praised some UNP leaders and declared he had looked after them. Similarly, they claimed he had now declared that he was now being well looked after. Amaraweera charged that the main aim of the UNP was to divide the SLFP, go for polls and win the elections. Kumaratunga, now in charge of policy planning for her party, had defended the UNP leadership. She had, however, agreed to convey their concerns to Prime Minister Ranil Wickremesinghe, the UNP national leader. The group also alleged that former President Mahinda Rajapaksa was spending large sums of money in his campaign to return as Prime Ministerial candidate. He was using the social media and was intensifying this campaign. He plans to publish newspapers. Hence, they argued that the passage of constitutional and electoral reforms alone would not bring results. The people should be told of bribery, corruption, nepotism and other malpractices at the highest levels of the previous administration. They should be dealt with, Amaraweera had said. “We told Ms Kumaratunga that we want to make sure that both constitutional and electoral reforms are introduced together. I cannot discuss the other details,” Amaraweera told the Sunday Times. The group’s claims about Rajapaksa’s political campaign gaining momentum appear correct. The former President has set up office at the Abhayaramaya Temple in Narahenpita. Arrangements are now under way for a protest march by some 5,000 members of the Buddhist clergy. Their next rally is being planned in Kurunegala. Concerns expressed by SLFP parliamentarians who were sworn in as ministers, deputies and state ministers prompted President Maithripala Sirisena to sound a note of caution at Wednesday’s weekly meeting of the Cabinet of Ministers. He said some UNP ministers had remarked that among the SLFPers who had assumed office were those who were corrupt. He said such remarks should not be made in the future. Sirisena’s note of caution was to draw a retort from Highways and Investment Promotion Minister Kabir Hashim. He said some on the SLFP side were making ugly remarks about Premier Wickremesinghe and urged that they should refrain from doing so too. President Sirisena was to then add that both sides should put a stop to such things. The meeting by an SLFP group with Kumaratunga and the remarks by Sirisena at the ministerial meeting make clear frictions remain within the coalition. That they are surfacing with only 13 days remaining from the 100-Day Programme of Work where a significant portion remains undone, no doubt, is cause for serious concern. Yet, there were also diverse opinions among even those SLFPers who received portfolios. This week Premier Wickremesinghe received the report of a three member Committee that probed Sri Lankan Airlines. It was headed by attorney J.C. Weliamuna. Responding to questions from the media about no arrests of people involved in malpractices, Aviation Minister Reginold Cooray said the legal process should take its course. He said action could not be carried out haphazardly. That these issues come at a time when there are greater controversies for President Sirisena and the UNP-dominated Government is no secret. Main among them is the 19th Amendment to the Constitution and Electoral Reforms. The Supreme Court (SC) will sit tomorrow, for the third day, to hear the Attorney General respond to arguments in some 19 petitions. A few are interventions on the petitions that have been filed. It is only then that the SC report to the Speaker on the constitutionality of the 19th Amendment will be given. The passage of all provisions in the amendment hinges on the ruling of the SC. The 19th Amendment is to be taken up for debate in Parliament on April 10. The SC has already intimated to the Government that copies of the Bill for scrutiny by the SC should be made available on time. This is after it transpired that the copies of the 19th Amendment that was gazetted had not reached the court even whilst some petitions had been filed. However, electoral reforms have become a vexed issue. So much so, the National Executive Council on Thursday decided to conduct the next parliamentary elections on the existing proportional representation system. This will be the last time such an election would be held under this system but a controversy over the issue appears to be growing within the SLFP which was not represented at the meeting. Prime Minister Wickremesinghe proposed that a provision be included in another amendment to the Constitution for the setting up of an Electoral Reforms Commission. Such a Commission is to be required to formulate within two months how reforms, the broad principles of which have been agreed upon, should be carried out. Main among them is the proviso that seats in Parliament should not exceed 250. Prime Minister Wickremesinghe said yesterday that these electoral reforms would be presented in Parliament as the 20th Amendment to the Constitution. Supporting the move was the Jathika Hela Urumaya’s Venerable Athureliye Rathana Thera, Sri Lanka Muslim Congress leader Rauff Hakeem and JVP leader Dissanayake. The Tamil National Alliance (TNA) remained non-committal. Yet, its leader Rajavarothayam Sampanthan told the Sunday Times, “I don’t think the electoral reforms can be concluded at the same time as the 19th Amendment. There should be consensus. It cannot be done immediately.” However, no representative of the Sri Lanka Freedom Party (SLFP) was present at that meeting except for its leader, President Sirisena. Hence, the official position of the party is not clear. His own position as Leader of the Opposition has become an issue after 26 SLFP parliamentarians joined the Government and accepted ministerial, deputy and state ministerial portfolios. Speaker Chamal Rajapaksa is to rule on Tuesday on whom he recognises as the Leader of the Opposition. Some political parties argue that since the SLFP is now a partner in the Government, it cannot also remain as the Opposition in the House. Another section is in favour of Mahajana Eksath Peramuna (MEP) parliamentarian Dinesh Gunawardena being named for the post. SLFP General Secretary Anura Priyadarshana Yapa has declared that his party was in favour of de Silva continuing in office, a position which political sources indicate may be recognised by the Speaker. These sources said this is no different to President Sirisena, who is leader of the SLFP under whom a UNP-dominated Government is functioning. Yet, how the voting will go after Parliament debates the 19th Amendment remains a crucial question. There is a smaller dissident group who may vote against 19A. They are made up mostly of those who know they will not receive nominations to contest the upcoming parliamentary elections and are backing the return of Mahinda Rajapaksa as the Prime Ministerial candidate. However, their role cannot be dismissed altogether in the light of growing support they have begun to receive within the SLFP. At first the leadership of the SLFP was thrust on President Sirisena. He was to later declare to party cadres that he took over the leadership to ensure the success of the 100-Day Programme of Work and safeguard the party. The fact that he could not muster sufficient support resulted in inducting some of the SLFP parliamentarians into the Cabinet of Ministers and others to subordinate positions. Now, it appears that even that move has not garnered all the support within the SLFP parliamentary group. Under these circumstances the question that begs answer is whether Sirisena has painted himself to a corner in the SLFP, and lost control. On the other hand, the high pitched campaign of Rajapaksa supporters could fizzle out if by chance he is denied SLFP nomination forcing him to form his own front to contest parliamentary elections. In fact, some Rajapaksa confidants do not rule out this possibility. Notwithstanding this, Rajapaksa has delivered another message to Sirisena and his UNP-dominated Government — that any action against him would not be easy since he commanded public support. A big indicator that SLFP nomination could be denied to Rajapaksa came in remarks made by Chandrika Bandaranaike Kumaratunga this week. Speaking at a ceremony arranged by the Ranaviru Seva Authority for mothers and wives of war heroes, at Ape Gama in Battaramulla last Monday, she said, “It is a crime to talk about the war and try to return to power. I completed 11 years ruling the country without losing any election and thereafter left. This was in keeping with my upbringing. If necessary I could have amended the law and stayed on. I could have provided liquor to supporters and got them to Horogolla (the ancestral home of the Bandaranaikes). I could have got them to roll on the ground and cry. But I do not believe in such dirty things. Some have won the elections and others have lost. Even now we should give the benefit of ending the war to the people of this country.” All this, no doubt, would be to the advantage of the UNP at the elections. Some of the MPs are also mulling over the idea of an impeachment motion against President Sirisena. The idea is to prevent him from dissolving Parliament as stipulated in the Constitution. It says that a resolution to remove the President shall be signed by not less than two thirds in Parliament or by not less than one- half of the MPs in Parliament and that of the Speaker. The Speaker would have to be satisfied that such allegations merit inquiry and report by the Supreme Court. This is after the resolution is referred to the SC by the Speaker. However, it is clear that they are unable to muster required numbers for such a course of action. 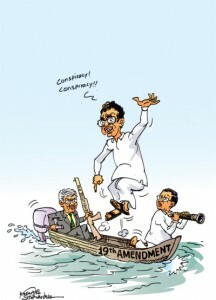 The source added “even without the votes of the dissidents, the passage of the 19th Amendment will have no difficulty.” This will mean, as agreed earlier by the troika – President Sirisena, Premier Wickremesinghe and former President Kumaratunga – dissolution will take place on May 5, just after Vesak. Polls will follow thereafter in the last week of the month that follows, June 27. Thus, electoral reforms are not expected until the new Government assumes office after elections. Yet, there are sections within the SLFP who claim there is a likelihood of the 19th Amendment being delayed due to lack of numbers. However, they are unable to come up with numbers for such a move. Elections Commissioner Mahinda Deshapriya on Monday made two different PowerPoint presentations to party leaders on models for electoral reform. One was a proposal to increase the number of seats in Parliament from the present 225 to 250 seats. Under this model, he said, elections were to be held to elect lawmakers for 150 seats from different constituencies. Such constituencies would have to be carved out. A further 75 would be elected through a district-based proportional representation system. In addition, 25 seats were to be on the National List divided proportionately among parties on the basis of the votes they poll. There appears to be consensus for this model though the SLFP’s official position is not clear. Another model which Commissioner Deshapriya proposed is the Mixed Member Proportional (MMP) voting system that is existent in New Zealand. The main characteristic of the model is that the mix of MPs from single-member constituencies and those elected from a party list. Each voter is entitled to two votes, one for the party and decides the total number of seats each political party gets. The second vote is to choose the MP from the electorate they live in. In this model, a political party’s share of the seats almost reflects the share of the overall nationwide party vote — a disastrous situation for minority and smaller parties if introduced in Sri Lanka. As one party leader pointed out, the Tamil National Alliance (TNA), for example, could end up with only two seats though it represents predominantly Tamil speaking areas of the North and East. In the New Zealand model, a political party that wins at least one electorate seat or five per cent of the party vote gets a share of the seats in Parliament that is about the same as the share of the party vote. At Thursday’s meeting, the NEC also discussed the introduction of the Right to Information Bill and the Bill to establish a National Audit Commission. These two pieces of draft legislation will first go before a Parliamentary Consultative Committee and will be taken up in Parliament on April 21. It is likely that the 20th Amendment to the Constitution, which seeks to create a Commission for Electoral Reforms, too would be introduced on this date. Premier Wickremesinghe briefed the UNP Working Committee, the party’s main policymaking body, on the constitutional and electoral reforms. He said the party should ready itself to face the upcoming elections by strengthening the grassroots level organisations. He also responded to comments by some members on criticism against the Government by saying they should answer all of them. Commodity prices, particularly the enhanced prices for purchase of paddy and the dropping prices for rubber were also raised. Finance Minister Ravi Karunanayake answered criticism that farmers were not receiving the prices announced in his budget proposals. Karunanayake also proposed that the party should examine whether it would be advisable for it to contest on the Swan symbol, the one that ushered Maithripala Sirisena to victory at the presidential elections. He opined that in doing so, the UNP was at an advantage in receiving ten per cent of the votes that went to Sirisena and the Swan symbol. He made clear he was not suggesting that even the SLFP was included in such an arrangement. His proposal was to examine whether it could be for the parties supporting the UNP. However, first to voice objections to the proposal was Minister Ranjit Madduma Bandara, MP for Moneragala District. Political developments in the coming week will be significant and will foretell the future of post-Mahinda Rajapaksa Government. The passage of the 19th Amendment and electoral reforms, no doubt, would be a signal achievement for the Government. However, if the moves to stymie their passage succeed, they will be forced to go to polls empty handed with unfulfilled empty promises. Such a turn of events could be politically devastating for the governing coalition and the Presidency. Do recurring trade deficits matter when there are balance of payments surpluses?